This is an unnamed guard at the prison where Avery Jenkins is held on death row. Initially, he tries to intimidate Stevenson by drawing attention to the Confederate symbols on his truck and by forcing Stevenson into an unnecessary strip search. As a child of the foster care system, he later identifies with Stevenson’s arguments about how Avery’s traumatic past impacted him. The guard reforms his behavior, shows kindness to Avery, and quits the prison. The timeline below shows where the character “The white guard” appears in Just Mercy. The colored dots and icons indicate which themes are associated with that appearance. Ballinger-Dix, Elizabeth. "Just Mercy Characters: “The white guard”." LitCharts. LitCharts LLC, 21 Jun 2017. Web. 21 Apr 2019. Ballinger-Dix, Elizabeth. "Just Mercy Characters: “The white guard”." LitCharts LLC, June 21, 2017. 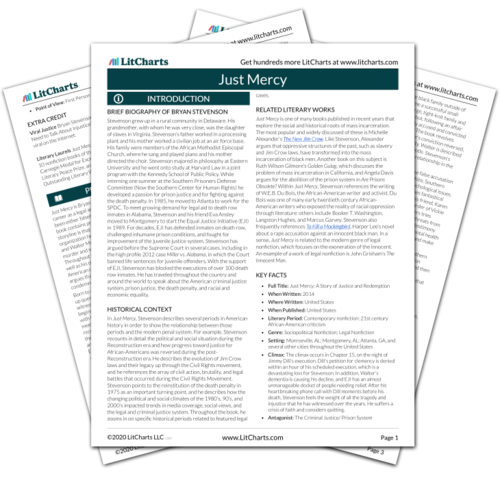 Retrieved April 21, 2019. https://www.litcharts.com/lit/just-mercy/characters/the-white-guard.